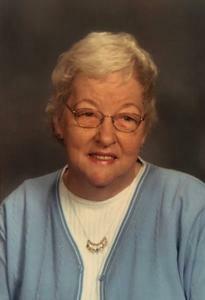 Nella Ruth Hoeve, age 82 of Holland, passed away Saturday January 19, 2019 at Resthaven Care Center. Nella was a lifelong resident of Holland, and was a member of Faith Christian Reformed Church. She was preceded in death by her loving husband Erv of 40 years, infant daughter Susan, and sister Edna Tamminga. She is survived by her daughters, Sandy (Steve) Vroegop, of Kalamazoo MI, Karen (Jay) Adams, of Bloomington IN, Kathy (James) Verhulst, of Holland; grandchildren, Ben (Evin Wallus) Vroegop, Josh Vroegop, Allison Vroegop, Lucas Adams, Matthew Adams, Bethany (DevIn) Potthoff, Tyler Vander Berg; sister, Marty Prins; sisters-in-law, Margaret Dryer, Marilyn Maidens, along with many nieces, nephews, and cousins. A funeral service will take place on Wednesday, January 23 at Dykstra Funeral Home – Mulder Chapel (188 W 32nd Street) in Holland with Pastor Chad Pierce and Pastor Jen Rozema officiating. A one-hour visitation will take place prior to the service. In lieu of flowers, memorial contributions may be made to Hospice of Holland, or Resthaven Care Center. Interment will take place at Restlawn Memorial Gardens.